This game is currently on hold. We will return to it in the future hopefully to finish up Episode 2 and 3. We are playing Star Wars using the West End Games d6 rules with some house ruled modifications. The game is taking place during the time of the Empire (Rebellion Era for those who are in the know) about 4 years or so before the destruction of Alderaan. The Rebellion is still in it’s infancy and Luke Skywalker has yet to reach the stars. Episode 1 has wrapped up and we are moving into Episode 2 which will take place about two years after Episode 1’s completion, Episode 1 having taken roughly six months of in-game time to complete (with hyperspace travel and downtime added in). The bios below reflect the current characters in the game and will be updated (with a note stating such) when characters have revelations about themselves and their pasts. The biographies below describe each of the important characters within our Star Wars game. Keep in mind that some bios will be shorter than others only because they are newer characters. with a build that suggests not only femininity but also athleticism. She has purple eyes, and her lekku and montrals are tattooed with thorny vines that wrap around the circumference. 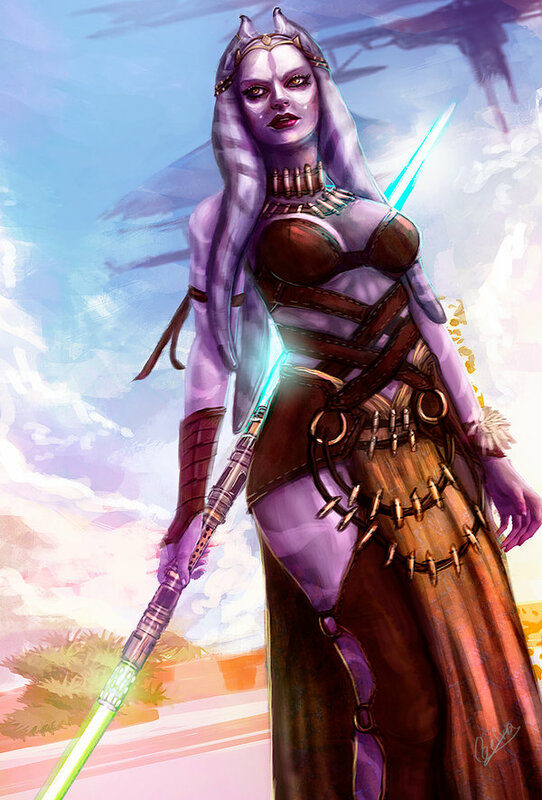 She is often seen wearing the revealing tribal clothing of her people with a double-bladed lightsaber on her hip. Background – Ri comes from a rough home on Nar Shadda. The only parent that Ri ever knew was her father, a kind human man, though he was a bit… flaky. 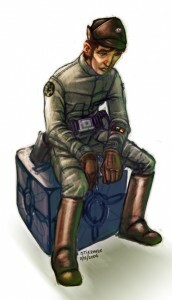 He was hardly home, as he often transported cargo for the Hutts. He would eventually hire a togruta nanny to watch after her, and she would come to call this person mother. At some point in Ri’s early childhood, her “mother” disappeared but not before she taught Ri about togruta culture and society and introducing her to others of her species. Once Ri got older, her father began to take her with him on his trips so that he would have some company. He taught Ri how to play sabaac as well as several other gambling games. She was never really good at them, but she loved playing nonetheless, and the rush of adding real money to the stakes made her blood rush even more. Ri and her father came back from one such trip here recently and found Imperial Stormtroopers were sweeping the area, something usually unheard of on Nar Shadda. When they got back to their ship, her step-dad got the ship into space before the TIE Fighters attacked. He held the ship together long enough to send it into hyperspace. Once they arrived back in real space in the outer rim, the ship began to break apart. Her dad stuffed her and his beat up old astromech droid into an escape pod and told her to avoid Imperials at all costs before jettisoning her into space. She watched as the ship which contained the only real parent she had ever known exploded. She has since wandered the galaxy with the droid, R5-L7, lying low when Imperials were around, but otherwise trying to get by on her guile, looks, and non-existent gambling skills. She recently heard of a contest to ride on a luxury transport and the ability to enter a sabaac tournament to boot. She entered the contest and won. Little did she know that it was all a set up. Imperials boarded the transport and Ri made a beeline for the docked starships, having overheard an older man bragging about a ship he had gotten from a friend. It seemed that others had the same idea and they all piled on, their own survival paramount at that exact moment. The ship however, actually belonged to someone who knew of the Imperial set up and was eager to find employees. The group escaped the Imperials, but Ri and her new compatriots were all now indebted to a mysterious Chiss who seemed to know more than he was letting on, especially when it came to Ri. Ri has since found an odd lockbox with a strange cube-shaped device ( a holocron) and a lightsaber, it was shortly thereafter that her training in the Force began. Update – Her training in the Force has since progressed greatly, and she has come in direct contact with one of the Emperor’s Inquisitors and barely survived to tell the tale. Now she has separated from the group after stealing a proto-type starfighter from the Empire (an X-Wing) and landing on the mysterious planet known as Tython. Description – Jackson is an average looking human male with red hair and light green eyes. He stands at five foot eight inches and has a thicker frame. He is often seen wearing mechanics coveralls, and while they are Imperial issue, all of the patches and rank insignia have been removed. Background – Jackson enlisted into the Imperial military the first chance he got, figuring it was his civic duty as a citizen of Coruscant. He found that he had a natural knack when it came to working on machines of all kinds and that landed him in the hanger bays early on, working on shuttles and low-end transports, but eventually earning his way into working on the higher-end shuttles and the star fighters. Jackson eventually took his officer’s training and became a deck officer, and earning him the right to fly the shuttles for important military personages from time to time. Then his time to prove himself came – he would personally fly a shuttle that would carry Darth Vader himself. Something went wrong on that flight and the shuttle crashed. Both Jackson and Vader survived, but Vader took exception to his pilot, despite it being a mechanical error. Using the unseen strength of the Force, Vader ripped a piece of the hull off and threw it at Jackson who was already on the run. The piece hit him square in the side of his face, burning and cutting him severely. He collapsed from the pain and shock caused him to go unconscious, which likely saved his life as Vader thought Jackson was dead. Jackson would leave and disavow the Imperial military after that incident. He would drift and work odd jobs until he was hired by Koruuda the Hutt to work on his luxury transport, that is until he found out about the Hutt’s collusion with the Empire. Update – Jackson has since joined the Rebellion, happy to see others of like mind willing to sacrifice in order to see the destruction of the Empire. 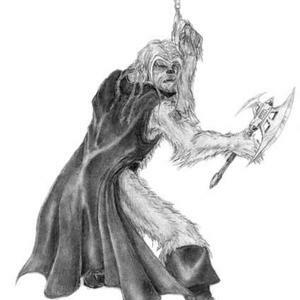 Description – Gand looks like…well a Gand, though a very well armed one. He has the insectoid features and multi-faceted yellow eyes that all of his race tend to have. He currently has no other distinguishing features. Background – Gand has not yet established himself enough among his own kind to have earned a name, though that is his wish. He is currently out to prove himself by bringing back a very dangerous criminal – a rogue Findsman. Findsmen among the Gand are the ultimate hunters, Force users who use their abilities to track down and eliminate their targets with ruthless efficiency. Should Gand bring back the rogue he will have earned his name. with an attractive but slender build. 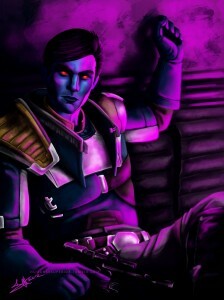 He has midnight blue hair that he keeps cut to just above his shoulders, and he has the typical red eyes of a chiss. 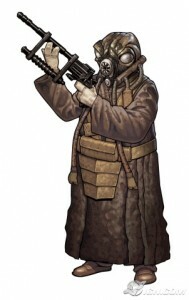 He wears an old faded uniform of unknown origins which he wears a black leather vest over. He also wears a dark brown long leather duster and a matching wide-brimmed hat. He is never seen without his two heavy blaster pistols, one in a holster on his side, and the other at his hip. Background – Vinthar is currently the “benefactor” of the group, as they stole his ship from his friend in order to escape the Imperials. As a result he told the group that they could keep the ship as long as they were willing to work off the price by doing jobs for him. He has given them two jobs, one an infiltration mission, and the other a smash and grab. They excelled at the first but failed and were captured during the last. He rescued the group and managed to get the goods he was after, but he has reservations about sending the group into a situation where they would have to rely on combat now. It has been recently revealed that Vin was working closely with a group of disgruntled Imperial Senators including Bail Organa of Alderaan and Mon Mothma. He was directly involved with getting them supplies and ships by directing his “employees” to do various jobs for him. This has made the player characters directly involved with the creation of the Alliance to Restore the Republic. 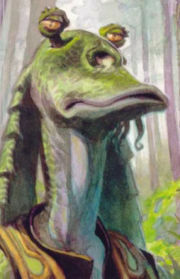 Description – Jurra is a typical gungan with swamp green skin and many scars that attest to his skill in battle. He carries a huge gattling smart-gun blaster and several unique “boomer” energy grenades. He often wears a suit of covert ops armor with pouches and equipment needed for any mission. Background – Not much is known about Jurra at this time other than he works for Vin, and was the one responsible for gaining the data that helped the group find the factory that was making the prototype starfighter that they recently stole. Description – Kat’thurr is large, even for a wookiee. Standing at just under nine feet tall, Kat’thurr really stands out, especially since his fur is white with black striping. He has bright blue eyes and is never seen without his ancestral bowcaster. Background – Kat’thurr is a young wookiee and has not known the galaxy other than under the yoke of the oppressive Empire. Born into slavery, he did menial hard labor for the Empire before being sold to Koruuda the Hutt, who put him to work as a bouncer on his luxury space transport. While working on the transport he clandestinely learned how to pilot the ship and became quite good at it. It was during an Imperial boarding of the transport that the wookiee made his escape with the help of the others on his team. He feels that he owes them a life debt and will sacrifice life and limb to protect them at all costs. 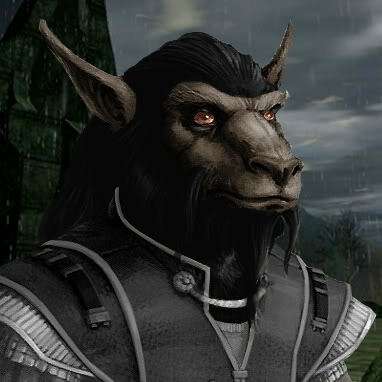 Description – Terrkor is of average height and build for a Bothan with black fur and grey eyes. He is often seen wearing a long coat and a wide-brimmed hat. Under the coat is standard issue body armor and a wide array of weaponry. His favored weapon however is in the locked case that he carries with him at all times – his portable computer which he uses to hack into networks in order to complete whatever mission he is on. Daa’Ri, Jackson, and Kat’thurr all had their reasons to be aboard the luxury star transport owned by Koruuda the Hutt. When the Imperials decided to take a boarding action to “search for contraband” however, the three of them did not want to stick around, again, all of them had their own reasons for this. They found a code for a freighter docked with the transport and made their getaway. Unfortunately for them, the ship was owned by someone who did not take kindly to it being stolen. He activated an automatic recall device hidden on the ship and brought the three wayward thieves to him. “Him” was actually a dispossessed Chiss by the name of Vin’Thar and he was willing to make a deal with the three resourceful people – work for him in order to earn the ship. It was reasonable enough right? Well it would see the group grow in size as there were others who owed Vin in some way or another. Soon a Gand and a Bothan espionage agent joined up and they were off to steal various weapons and data from what seemed to be various pirate groups. Where these supplies went after Vin received them, they did not know. Eventually Vin had the group meet with him on Alderaan, but a hyperspace mishap saw them landing on an uninhabited world not on the charts. They found that while there weren’t intelligent inhabitants, there were humanoid inhabitants. Humanoids that seemed to want to either devour them or to turn them in whatever it was that the creatures were by spreading their disease onto the group. After a harrowing trip to a capital class starship of unknown configuration, the group finally got off the planet, but not before finding out some of it’s secrets – the creatures were created by a plague and were called Rakghouls. The planet? Taris. The group FINALLY made it to Alderaan and reported to Vin who introduced them to Bail Organa. After a lengthy conversation and a promise to meet with Bail in a secret location, the group headed off for a much needed rest. When the group met up with Bail they found other senators there as well, including the influential Mon Mothma. They also noticed a dark individual there, and Daa Ri felt waves of Dark Side energy coming from him. It was revealed that he was none other than Galen Marik – Darth Vader’s apprentice, though he was aiding this newly formed alliance in order to help overthrow the Emperor, which is what his master apparently wanted. It was here and now that the group witnessed the birth of the Alliance to Restore the Republic. Their next two missions were to locate data on Coruscant itself that would lead them to a secret starfighter installation, and then infiltrate, set up hyperspace beacons and then steal the prototype starfighter (Which happened to be the Incom T-65 X-Wing Superiority Starfighter). The group pulled off the mission with great success. After Daa’Ri made her hyperspace jump however she found herself above a strange planet that was decidedly not Alderaan. After checking her coordinates she found it was the coordinates of a planet called Tython, given to her by the strange Force spirit she encountered on Taris. The rest of the group arrived on their freighter only to find that Daa’Ri had not arrived, and neither had the X-Wing prototype.